Sick of the holiday hype, and ready to rip your ears off when you hear “All I Want For Christmas Is You” for the umpteenth time? Well tonight, Bootie LA returns upstairs to The Echo to free you from the endless rotation of Christmas music by playing absolutely ... NONE OF IT! Not a single holiday mashup in the mix – you get to dance for hours without holiday intrusion! Only $5 before 10 PM! Returning to THE ECHO for this special night! Entrance is still in the back by the Echoplex however! Sick of the holidays yet? So are we! Bootie makes you a promise: No Christmas music tonight! Sick of all the holiday hype? Know you’re going to get something crappy in the Secret Santa exchange at work, and dreading to see what atrocity your aunt puts under the tree thinking it’s the perfect outfit for you? Well, for this party, Bootie promises to free you from the endless rotation of Christmas marketing and Christmas music by playing absolutely … NONE OF IT! Not a single holiday mashup in the mix – you get to dance for hours without holiday intrusion! For this special night, Bootie LA returns to its original home – upstairs at The Echo (but the entrance will still be in the back alley by Echoplex). 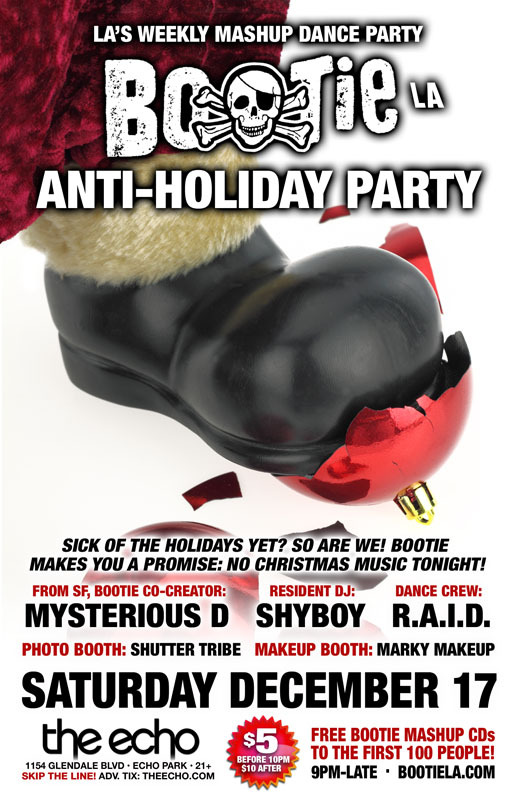 Bootie co-creator Mysterious D comes down from Bootie SF to join Bootie LA resident DJ ShyBoy in playing a mix of your favorite holiday-free mashups, guaranteed to keep your feet moving and your bodies bouncing late into the night!! Resident dance crew R.A.I.D. will fill the stage with go-go eye-candy all night, Marky Makeup gives you an Xmas free makeover, and of course Shutter Tribe will be there to capture the party!